Now you know it is interesting that Jesus talked about seeing, but He hasn't yet sent that message. You see the messages, understanding, deaf ears, paralyzed hands, but now we need to look at the next miracle. Because they go from Decapolis all the way back up again, over the upper side of Galilee where they're all from and they come to Bethsaida…Peter and Andrew and Philip's hometown. And some people brought a blind man and begged Jesus to touch him. I'm in Mark 8:22. So once again, He touched the man. Jesus put His hands on his eyes and the man who looked up now had eyes opened! And his sight was restored. And he looked intently and he saw everything clearly. There is a progression in this passage from not being able to see to looking and only seeing trees instead of men…and then to having his eyes opened until his sight was restored and then this progression, he sees everything clearly. That's the whole point, my friends. As leaders, we go from not being able to see to seeing trees for men, trees instead of truth. Then we look intently and our sight is given to us and we see everything clearly. Blind eyes, not seeing. 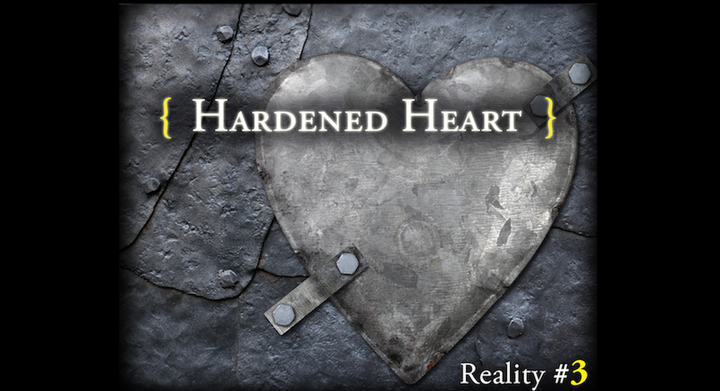 Here we have Reality #3, the reality of the hardened heart. A hardened heart is a heart that says the right thing, but misses the real point. It's a heart that has all the facts, but lacks the faith to trust the Lord. Lacks the confidence, is fighting to protect itself instead of taken the risk of giving everything over to the Lord. A hardened heart. See, there are four message miracles. Understanding, hearing, doing and seeing. That helps us gain insight into the hardened heart. That's the message Jesus was saying. Because you see a hardened heart learns without perceiving, listens with hearing, acts without impacting and looks without seeing. That's why you're so frustrated. Let me say this to you again. A hardened heart learns without perceiving, listens with hearing, acts without impacting and looks without seeing. That's why our leadership is so confused when we don't enter into these realities. So I ask you this question. What evidence do you see of hardened hearts? In you and in those whom you lead? What can you do to overcome a hardened heart? That's a great question, I think. And that's where we're headed next. But for now, I ask you this question. What is in your heart?